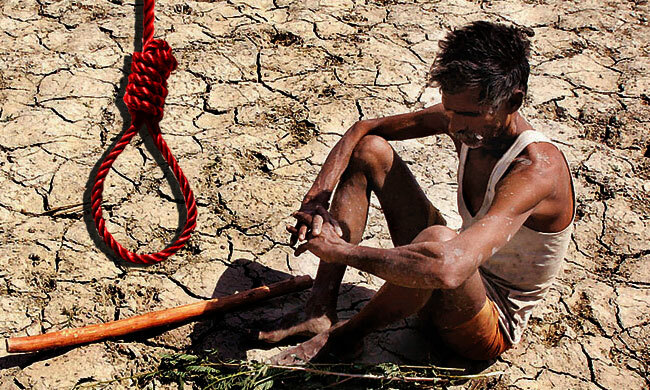 As many as 12,602 farmers committed suicide in India in the year 2015. While many studies reason the suicides on the worsening agrarian crisis, three farmers have moved a PIL in the Supreme Court blaming "draconian" Article 31B for acting as "neck noose strangulating lakhs of farmers" since the day it was added to the Constitution by shielding many anti-farmer laws in the Ninth Schedule from judicial review. Three farmers from 'Kisan Putra Andolan'—Makarand Mallikarjun Dojiad from Pune, Maharashtra; Naresh Ramayya Cheguri from Telangana and Changauda Basgauda Patil from Karnataka have moved the PIL through advocate Anuj Saxena praying that Article 31B be struck down for being unconstitutional, ultra vires and invalid. Article 31B protects Acts and Regulations specified in the Ninth Schedule from being declared void ever on the ground that they violate the fundamental rights or the basic structure of the Constitution. Laws such as the Agricultural Land Ceiling Act, Essential Commodities Act, Land Acquisition Act, which the farmers say are anti-farmer, are in the Ninth Schedule and therefore, protected from judicial review by Article 31B, which the petitioners say, is one of the offspring of the ill-motivated political ambitions of the Government from time to time. As per the Land Ceiling Act, a farmer can hold only 18 acres of irrigated land. The Land Acquisition Act allows the government to take over land for public works in lieu of compensation while under the Essential Commodities Act empowers the government and not the farmer to fix the price of agricultural produce. Tracing the history of the First Amendment Act, 1951, by which Article 31B was introduced, the petitioners say the sole purpose of the Article was to protect the Zamindari Abolition Acts from the onslaught of Judicial Review by the Supreme Court and various others high courts and should have been chucked out at the very threshold of its incorporation into the Indian Constitution. The PIL said that while on the one hand Article 32 empowers an individual to approach the apex court in the event of any infringement of fundamental rights, on on the other hand, Article 31B said laws inconsistent with the part III cannot be challenged before any Court of Law if they are included in the Ninth Schedule of the Constitution. "A combined reading of Article 31 B and Article 32 of the Indian Constitution creates a paradox in the understanding of Constitution itself," it said. "On one footing, the Constitution says that the State shall not make any law which takes away or abridges any of the rights conferred by Part III of the Constitution, and on the other hand says laws inconsistent with the part III cannot be challenge before any Court of Law if they are included in IX schedule of the Constitution. ..The incorporation of void and illegal Acts in to the Constitution to make them constitutional is a striking proof of failure of the Indian legislature to conform the constitution under which it works," it said. The PIL also said that the Doctrine of Judicial Review as evolved in the I.C. Golak Nath & Ors. v. State of Punjab and overruled in Keshavananda Bharti v. State of Kerala falls short on the touchstone of judicial review which is a part of the basic structure of the Constitution. The Doctrine of Prospective Overruling was first invoked by then Chief Justice Subba Rao in I.C. Golak Nath & Ors. v. State of Punjab when deciding the Constitutional validity of the Constitution (Seventeenth Amendment) Act which placed the Punjab Act in the Ninth Schedule. By applying this doctrine, an 11-judge bench by the a majority of six to five held that the constitutional amendment is 'law' within the meaning of Article 13 of the Constitution and, therefore, if it takes away or abridges the rights conferred by Part III thereof, it is void. It was, however, declared that the Parliament will have no power from the date of the decision (27th February 1967) to amend any of the provisions of Part III of the Constitution so as to take away or abridge the fundamental rights enshrined therein meaning thereby that the seventeenth amendment was not affected by the judgment. After this, in Keshavananda Bharti v. State of Kerala, it was held that the Parliament cannot destroy the basic structure of the Constitution. The judicial review was also held to be part of the basic structure. Thereafter, in case of Waman Rao v Union of India, the court held that amendments in the Ninth Schedule made before April 24, 1973, were beyond challenge, thereby, giving effect to the Doctrine of Prospective Overruling from April 24, 1973. The petitioners, however, said that "the interpretation of Doctrine of Prospective overruling with effect from 24th April 1973 amount to usurpation of Judicial Power by the Judiciary itself". "Doctrine of prospective Overruling protects the transactions taken place and the actions done however it does not immune the unconstitutional amendments to remain in existence despite the patent contradictions with the basic structure of the Constitution. Doctrine of Prospective overruling and Doctrine of Basic Structure should be harmoniously interpreted," said the PIL. According to the petition, a total of 12,602 persons involved in farming sector, 8,007 farmers cultivators and 4,595 agricultural labourers committed suicide during 2015, accounting for 9.4 percent of the total suicide victims (133,623) in the country. Maharashtra holds the dubious distinction of being the farmer's suicide state in India with 4,291 suicides, followed by Karnataka with 1,569, Telangana 1,400, Madhya Pradesh 1,290, Chhattisgarh 954, Andra Pradesh 916 and Tamil Nadu 606. Together these seven states accounted for 87.5 percent of total suicides in the farming sector in the country. a)	To issue a writ in the nature of mandamus or any other appropriate writ to struck down and/or declare Article 31 B of the Indian Constitution as unconstitutional, ultravires and invalid. b)	To pass any such further order and/or directions regarding the harmonious interpretation of Prospective Overruling doctrine with the inherent limb of Judicial review.